Early morning on the Snoqualmie. East of Fall City. No fish caught but a fantastic morning to be on the river. 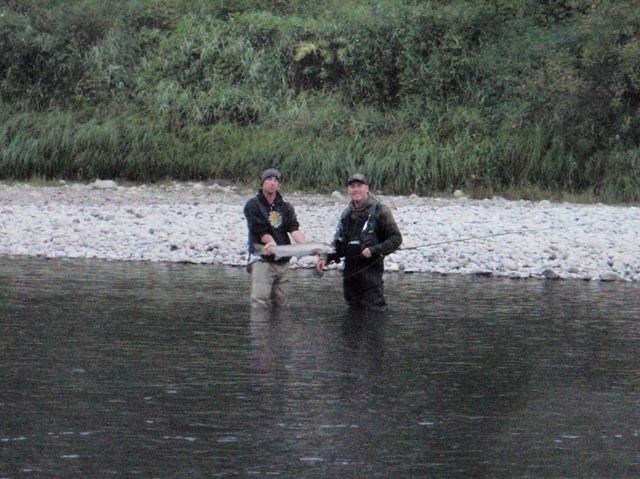 3-4 others fly fishing and all with spey rods. 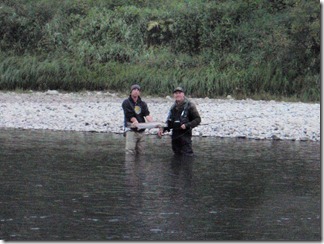 I was trying for steelhead on a 7wt floating line with various self-tied Skykomish Sunrise style flies. I’ve switched to a floating line to stop getting snagged on the river bottom or losing flies on the backcast when the fly hits a rock. This seems to happen when I’m wading into a river and am effectively getting lower and lower relative to the banks and the backcast loop is at roughly the same height as the shoreline. Also, it appears to happen more frequently when I’m on a heavier sinking line where the loop of the backcast is that little bit lower and therefore closer to the ground. Daniele in the mist. Another magic morning on the river. 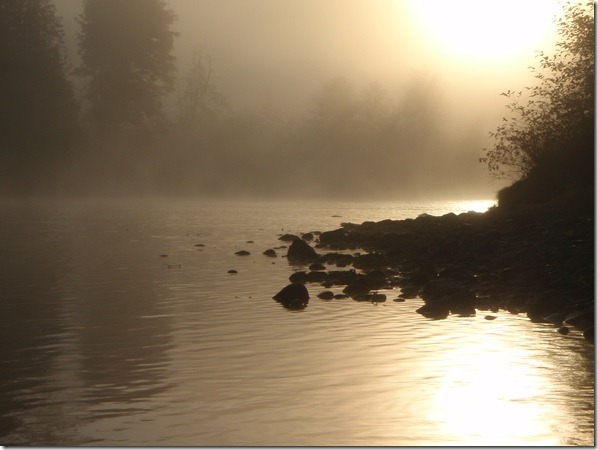 Nothing taking the fly yet but still a lovely morning out on the river up stream from Fall City. 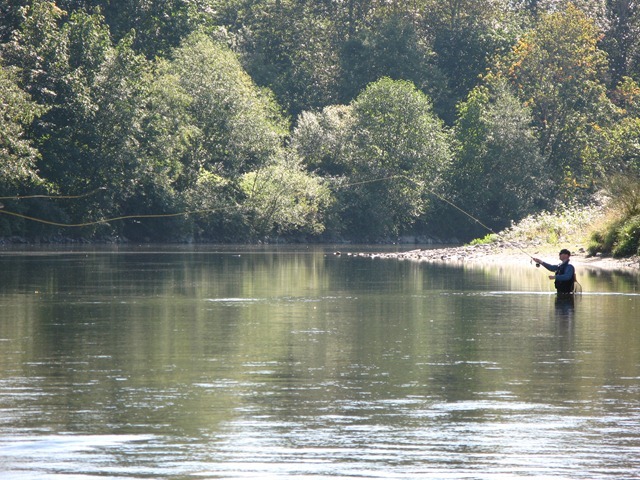 The river is fairly low at the moment so it is strictly floating lines if you want to avoid snagging the bottom. Ok, I was lucky, only my third time trying for steelhead. 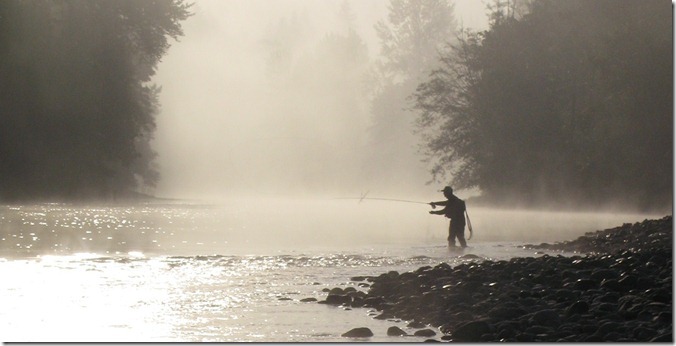 Early morning just downstream of the bridge at Fall City I managed to land a decent-sized female hatchery steelhead. Although, I must say, it was touch and go whether I was going to hang on with the fish taking off so fast downstream I was left with about 2yards of backing line and scrambling along trying to keep up. 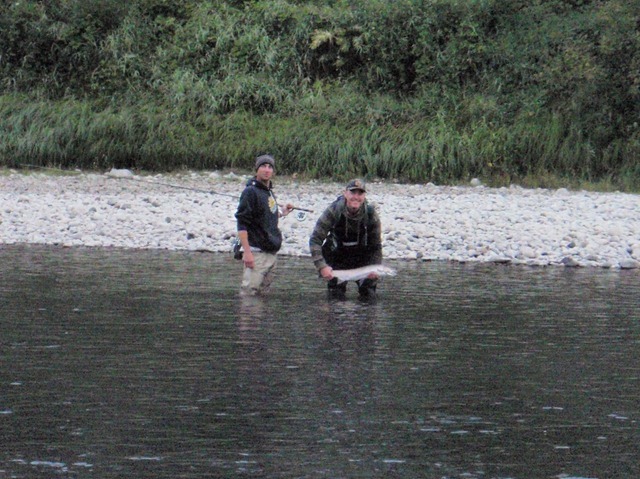 I was doubly lucky that on hand was an Orvis fishing guide from the Bellevue shop – he tailed the fish for me after helping me wade across the river to get into slower running water. The whole thing was just amazing…shortly after the photo we released her back into the water. She was caught using a 7wt sinking tip and a self-tied Skykomish sunrise. Trying for the elusive steelhead but instead catching this little thing. Taken on a self-tied variant of a Purple Peril directly under the bridge at Fall City. 7.30am Snoqualmie river between Fall City and the Snoqualmie Falls. Someone else fishing in the far distance. Foul-hooked a salmon which took some time to realize it had been snagged and then eventually took off down-stream. Stripped all the line off the reel and then broke the tippet. The left picture has me casting across to the north side of the Snoqualmie. Daniele and I had floated down about 0.5 mile in the canoe having put in at the bridge at Fall City. 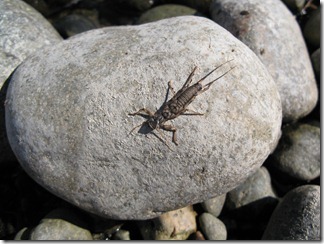 Right hand side shows a stonefly sitting on a rock next to the river.